Hello! 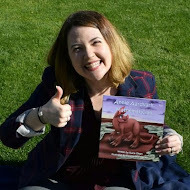 I've released the second book in the Annie Aardvark series, Annie Aardvark: Adding Ants, through Kickstarter! Check out the campaign here-- thank you to everyone who made the campaign successful! While the Kickstarter campaign is complete, Annie Aardvark: Adding Ants is available through traditional channels, like Amazon! Hope you enjoy! © 2016 Suzie Olsen. Simple theme. Theme images by sbayram. Powered by Blogger.